To those who thought the Passover Haggadah might have been exaggerating – think again. Millions of locusts have swooped down on to Egypt. As a reminder to those who thought the account related in the Passover Haggadah might have been an exaggeration – think again. Millions of locusts have swooped down in a swarm from the sky on to the land of Egypt. 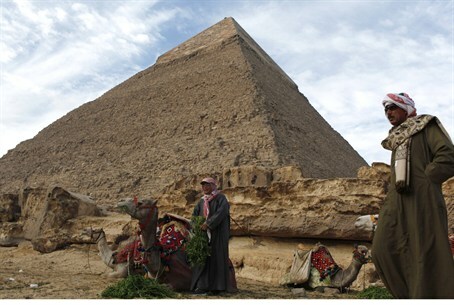 The locust plague struck over the weekend in the Giza region, home to a cluster of famous pyramids, according to reports in Arab media. Officials estimated that at least 30 million of the insects have swarmed on to the fields and farms about 15 miles southwest of Cairo. The locust swarm is causing massive damage to agriculture in the area, Alwatan News reported. In some parts of the Middle East, however, locusts are used for food – and one particular ancient type, known to Yemenite Jews, is actually considered kosher. Residents were warned not to try to drive away the locusts themselves in order to avoid creating further damage. Instead, “Egyptian armed forces and border guards are attempting to fight the swarm with all means at their disposal,” said Egyptian Agriculture Minister Dr. Salah Abd Al Mamon. Instead, Mamon noted the weather forecasters have predicted strong winds are soon to come, which he hopes will take the locusts towards the Red Sea, and Saud Arabia. The department also plans to use crop duster planes to address the infestation.